Not that I’m super bright or anything, but it seemed obvious that wotc was not going to put all the fetches in the same standard format. I’ve been saving zen lands and plan on unloading now then buying back in once they do get reprinted. Date for that is anyone’s guess. By the by. 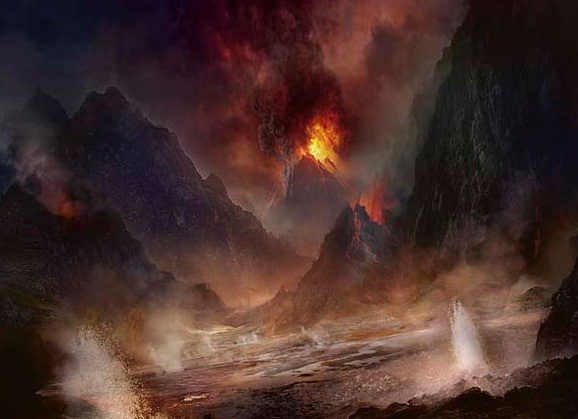 If return to zendikar meant landfall which meant fetches I would be pretty disappointed in r&d for not being able to make new lands matter abilities. Return of the full art basics! Well played Wizards. Well played. At the same time though, investments based on predictions and speculation involve risk. You would think the same people that pre-sold their zendikar fetches would have learned from the serum visions debacle after MM15 and Origins. What struck me as funny was the players that has sold their set of serum visions were then mad at the finance people – because they had expected a sure thing. Last one was Worldwake with the manlands, or fate reforged if you consider the the life lands as a valid answer. @kraeuteurbuddha There’s been lots of small sets with 5 duals. If by duals you mean “fetchlands”, then you are def correct. First up, thanks for your article! Second, I really look forward to the new full art lands, this was definately what I was expecting from the new set. About the enemy fetches, I was kinda expecting that there would be no reprint. 10 Fetches in Standart would have been somewhat special. Also I don’t think that they will sell them in a commander special, or, maybe they want to raise the amount sold like that? Hard bet here I guess. I must say I really expected WOTC to reprint these. My loss. Was there any predictable sign that I missed out, except from the fact that 10 fetches in Standard would definitely slow the game down? The enemy duals in Origins was a sure sign there wouldn’t be enemy duals in BFZ. Also I just don’t think they would want to waste their reprint equity so soon after reprinting onslaught lands. I just bought 4 misty rainforests for €170 or $185. The day I sign up for deckbox sales, I put up a bunch of cards including my mistys for a quick sale (checking prices that day), not expecting BFZ spoilers until september as planned by WotC. A few hours later, the announcement allegedly happened and before I knew it my set of mistys sold for 30usd each. PRETTY COOL MARO. I looooovvveee losing money. You didn’t lose money. You just didn’t make MORE money. It’s not the same. My guess is they’ll wait at least until the khans fetches rotate to reprint, so maybe the large Spring set 2016. Or maybe wotc will throw them in Conspiracy next summer if that’s even going to be a thing. Great way to sell that set. Throwing them in Commander would be a bad idea as its antithetical to its purpose – making edh cards available to non competitive players. Not that wotc is immune to bad ideas. I wouldn’t mind enemy man lands… That would be sweet. But yeah, I’m a little pissed that I’ll have to sub flooded strands for scalding tarns for at least another year. There is something interesting though. 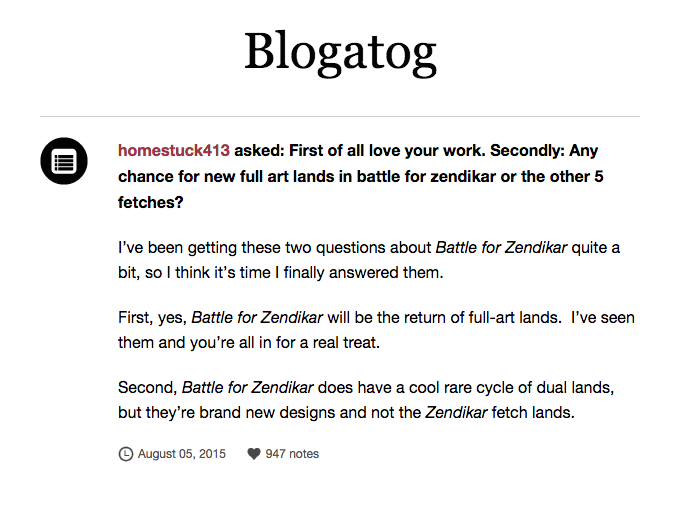 It says there will be a dual land rare cycle, just not the Zendikar fetches. Dual land cycle I believe might be the filter lands. Their prices have been going up a lot and could use a reprint for the Modern players. My other guess is a reprinting of Man Lands or new man lands?? I too don’t think the enemy fetches will be in Commander 2015. I like the idea that the enemy fetches are in the set after Battle. Without fetches I don’t see landfall being a thing for Battle however. The other possibility: 3 Color Bolt Lands…take 3 damage to come into play untapped but gives you access to 3 colored mana. So now your Mystic Monastery can bolt u so that you can Wild Slash your opponent turn 1 lol. They will be like no other lands we currently have, think bigger. Whether or not they will have an impact on modern is something only time will tell. My guess is no, but I’m going to be optimistic. The scry lands certainly don’t seem like they will see any play outside of standard. There are so many better options. At least you can turn Celestial Colonnade into a Serra Angel when you have an oportunity. I am not surprised that they aren’t reprinting the enemy fetches. I kind of knew before the clear signs of enemy pain lands and the printing of Evolving Wilds in Battle for Zendikar. I will admit that the allied fetches surprised me a lot. I figured that is what they would put in Zendikar. I’m not mad though. I enjoy playing my fetches too much to ever sell them, even for profit. The thought of re-obtaining them makes me cringe too much. As a competitive modern player having optimal mana bases whenever I play modern is fairly key to success. If you have extra’s sure cash in, otherwise hang onto them until you hear it from the horses mouth. You might miss a peak, but you won’t be mad at yourself! The more unfortunate thing is those who missed them the first time are still in a kind of limbo. I feel for you, I really do. The only advise I can give you is stay patient or get thrifty. I am not too verse in magic cards that were released when I wasn’t into the game and doing other things, but I have an idea for new land.. maybe similar to “filter lands” but what about if they put lands that are one color, but if you pump in a colorless, then you can tap to get the other color? It is a slightly different mechanic that could jolt the finance scene to think outside of reprints. There is no fun speculating on reprints.